Oilfield Support throughout the years. After seeing a 1953 Desk & Derrick parade float in an old newspaper, George Burnett owner of "I Love Drilling!" decided it was time to re-create this float and the support behind domestic energy production. 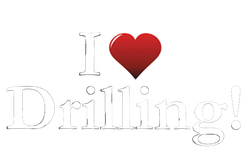 2012 Vernal's Oil and Energy Parade coordinated by "I Love Drilling!"